The following are detailed specifications about the Modern Pharmacy Lamp in Aged Copper Finish. Modern aged copper floor lamp with metal shade. 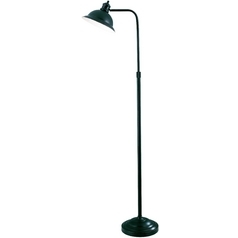 This fixture will also take a 150-watt medium base incandescent bulb (not included), product 16276. This Modern Pharmacy Lamp in Aged Copper Finish is part of the MINUTEMAN Collection from Lite Source Lighting. The following items are also part of the MINUTEMAN Collection.